Traditionally, birth trauma is a medical term used to describe any sort of injury or damage sustained by infants during childbirth, from minor cuts and scrapes to severe head injuries. In more recent years, however, the phrase has come to define a second set of medical conditions, no less significant, which can affect new mothers. In this article, we’ll cover these two interwoven forms of birth trauma, discussing both mechanical injuries inflicted on newborns and the psychological effects of traumatic delivery. While a measure of bruising is to be expected, especially during vaginal deliveries, serious birth injuries can – and do – occur. These child injuries are caused by mechanical forces, like compression within the birth canal or traction exerted on a child’s head from outside. The birth canal, of course, is narrow, exerting considerable pressure on an infant’s delicate head, shoulders and arms. These normal, and largely unavoidable, mechanical forces can be enough to inflict damage on a newborn. 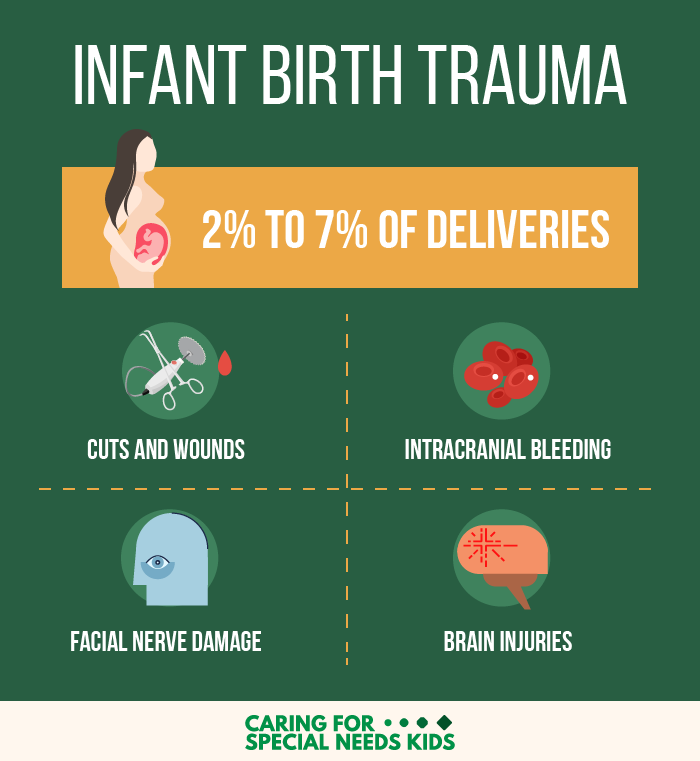 But that doesn’t mean traumatic birth injuries are always unavoidable. Far from it. In short, around 50% of birth trauma injuries could be prevented – if only obstetricians had properly evaluated a pregnancy for risk factors beforehand. Diagnostic technologies have come a long way over recent decades, granting birth teams the remarkable ability to identify and manage the sources of potential harm. Despite these advances in obstetric practice, children continue to suffer undue injuries at an alarming rate. There are various factors that predispose children to birth trauma injuries – none of which should come as a surprise to careful obstetricians. Women having their first child (prima gravida) – the risk of birth trauma decreases in subsequent pregnancies, largely because a woman’s abdominal muscles never fully return to their pre-delivery strength. Cephalopelvic disproportion (CPD) – a complication in which the child’s head is too large to enter or pass fully through the mother’s pelvis. While true cases of CPD are rare, many cases of “failure to progress” are inaccurately diagnosed as cephalopelvic disproportion. Cesarean section is often the appropriate solution. Breech presentation – one of several abnormal presentations, in which a baby does not enter the birth canal head first. Breech babies enter the birth canal feet or buttocks first, with the pelvis constraining their head, arms and shoulders. Faced with fetal risk factors like the ones above, many obstetricians continue to rely on birth-assistive technologies. While forceps and vacuum extraction can help ease a child through the birth canal, these tools can also cause severe harm, especially in the hands of an inexperienced practitioner. So far, we’ve only touched on the forms of birth trauma that can affect newborn infants. But birth trauma actually has two distinct, though interconnected, meanings, one of which has only come into use lately. In recent years, the term “birth trauma” has come to be used in reference to forms of post-traumatic stress disorder (PTSD) that some women experience after giving birth. These conditions, variously known as postpartum or postnatal stress disorders, develop in around 9% of mothers following delivery, according to Postpartum Support International. Mismanaged deliveries can result in severe consequences for children and mothers alike. When deliveries require medical intervention, the experience can be traumatic. Many women report feeling dis-empowered, disrespected and even abused during childbirth, forced to submit to the agenda of rushed medical professionals. These feelings, of course, are valid and deep. They can also be the basis for a medical malpractice lawsuit. [,] ranging from clueless insensitivity to unkindness and abject cruelty.” While true heartlessness is rare, a careless disregard for the safety and well-being of others is nothing new. We should demand more from our health professionals. Informed consent isn’t a suggestion; it’s an ethical and legal requirement. Both senses of the phrase birth trauma can be a sign that something went seriously, and perhaps legally, wrong in the delivery room. Medical negligence is an injustice – no matter who is harmed. By Michael Monheit| 2017-12-08T08:48:39-04:00	October 4th, 2016|Birth Injuries|Comments Off on What Is Birth Trauma?